Where is Tigh Na Bruach? What does Tigh Na Bruach mean and how is it pronounced? Is the house just overlooking Loch Ness or can I actually walk to the water's edge? How far are you from ...? How do I get to you on public transportation? Are you within walking distance of any stores or restaurants? How many rooms do you have and how many people can you accommodate? Do you have showers or bathtubs in the guest rooms? Do I have to leave the house during the day? Do you allow children or pets? We are based directly on the banks of Loch Ness, just outside the small village of Invermoriston, approx. 27 miles south-west of Inverness. Have look at our map to see our exact location. Tigh Na Bruach is Scottish Gaelic for "House on the Bank". It is pronounced "TIE na BROO-ukh (where the "kh" is a guttural sound, which equals the Scottish "ch" in "loch" or the German "ch"). You can walk to the water's edge! We even have a small private beach with a picnic table as well as a pontoon, where guests may fish. Inverness Airport. Approx. 36 miles and an hour's drive from Tigh Na Bruach. Where is the nearest train or bus station? 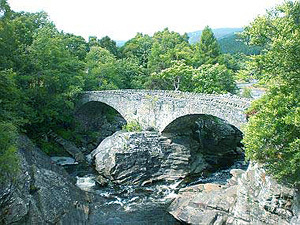 The nearest bus station is in Invermoriston; the nearest train station in Inverness. Having a car will be more comfortable, however, public transportation is available. Invermoriston has a small bus stop. Buses (some more, some less frequent) run between Invermoriston and Inverness, Drumnadrochit, Fort Augustus, Fort William, the Isle of Skye, etc. For further information and timetables, please check the Citylink website. Yes. Tigh Na Bruach is just outside Invermoriston (approx. 10 min. walk). There's a village store/post office (which sells general groceries, wines and spirits, gifts and even freshly cooked pizza) as well as two restaurants: The Glenmoriston Arms Hotel and the Glen Rowan Coffee Shop & Restaurant. We have 3 guestrooms and can accommodate 6 adult guests. Sorry, no bathtubs but guests comment on how good the showers are. We ask you to check in between 4:00pm and 6:30pm. We know this is not always possible and ask guests to give us a call en route with an estimate of their arrival time. Please check out by 10:30am at the latest, as we have to perpare the rooms for our next guests and also fit in our day to day living. You are welcome to stay around and have a relaxing day, sit on your veranda or enjoy the gardens. All we ask is that you vacate your room some time in the morning so we may clean and replenish anything you have used. Unfortunately we cannot accept children under 15 years of age or pets.